Can Slow-Moving Universities Adapt Quickly Enough to Teach in the Digital Age? The start of classes this fall will also bring renewed debate about what journalism and mass communications colleges should teach in an age of disruption. Professors are trying to figure out how we should be preparing students for jobs that don’t exist yet. Or for jobs that will exist in two years, but won’t in four. "Can universities designed to make slow, incremental, deliberative and consensual changes respond with the speed, risk-taking and adaptability demanded by today’s technological disruptions?" I wonder if everything we want journalism and communications students to know can be accommodated in the structure we have. Maybe curricular modifications are too small of an effort to bring about the changes we really need. Perhaps the nature of the university and the nature of journalism education in a digitally disrupted world require that we look at new ways to provide the training employers say they want in new hires. Can universities designed to make slow, incremental, deliberative and consensual changes respond with the speed, risk-taking and adaptability demanded by today’s technological disruptions? If the nature of universities and the needs of mass communication students are at odds, how do we fix that? Below are some thoughts on ways colleges are trying to square this circle to keep journalism curricula current and relevant. Extracurricular projects, the teaching hospital model, hackathons and innovation labs are ways various universities are trying to keep their curricula current. But none of those seems to be the systematic change we need. One way to revise curricula is to study what’s being taught, study what employers say they need, study the differences, study which of those differences students should know, study how to teach that, find who would teach it, then propose a class for two years from now to deal with the problem. In those two years, the department, college and university curriculum committees will study the proposed new course and get it on the schedule. That process works well for philosophy or history courses, but not for journalism courses. A more aggressive faculty would use temporary processes to teach a new class as a “current topic.” But that’s a temporary solution because topics classes usually can’t be continually repeated. The deliberative and committee processes still have to be tackled. Even when a timely new class is offered to meet a changed market need, students’ schedules often don’t let them take the class because their majors allow no or few electives if the student wants to graduate in four years. Foundations that fund journalism are joining the call for changes by proposing how they think journalism curricula should change. Last year, six foundations called on educators to blend practice and scholarship in the “teaching hospital” model called for by the Carnegie-Knight Initiative for the Future of Journalism Education. This model blends students, professors and professionals doing journalism together as they digitally inform and engage the community in new ways and then research the results. Some colleges of journalism and mass communications are doing great jobs having students provide news to their communities. But this is only a part of the teaching-hospital model. Missouri is famous for student classes providing community news. At Nebraska, students supervised by a faculty member with legislative reporting experience supply our state’s news organizations with free coverage of state government. The University of Maryland and Northwestern University have long had students providing news to the public. Arizona State University has state and national student news bureaus. But if this model of students, professors and professionals working in partnership isn’t informing and engaging their communities in constantly new ways, using new technology and studying its effects, it isn’t the model the foundations say is needed. And frankly, few of us are doing all that the teaching hospital model requires. I’ve been proposing a model that emphasizes multidisciplinary education. I want to create a Center for Mobile Media that would combine research professors and professors of practice working with journalism, advertising, public relations, computer science, design, business and marketing students. Each of those groups provides an essential piece needed to create a successful mobile media product, then study it in the field and improve it. But multidisciplinary education is probably one of the more difficult and slower changes a university can make. Two or three colleges, each with their prerequisites and requirements, each trying to fill the student’s time with required, not elective classes, geometrically complicates the ability to create a multidisciplinary class. To test the type of projects a multidisciplinary Center for Mobile Media might do, I tried using extracurricular clubs or informal gatherings of students to teach skills that haven’t yet made it into the curriculum. For instance, last fall I sponsored a hackathon that attempted to bring journalism, advertising, computer science and design students together to create a mobile app. Despite having a grant that allowed me to pay $1,000 for the winning app, the hackathon was a failure, so we had to figure out why. Not enough students attended to even form one team. I think the term hackathon scared some people away, but a big problem was simply trying to fit a Friday-Saturday creative marathon into students’ schedules — especially on a football weekend. My colleague Matt Waite, developer of the Pulitzer-winning PolitiFact.com, holds “Maker Hours,” an open lab on Friday afternoons for people who want to learn to make websites, mobile sites, drones or sensors. Our college supports the Maker Lab as a way to supplement students’ skills. The same is true for Waite’s Drone Journalism Lab, funded by a grant from Knight Foundation. 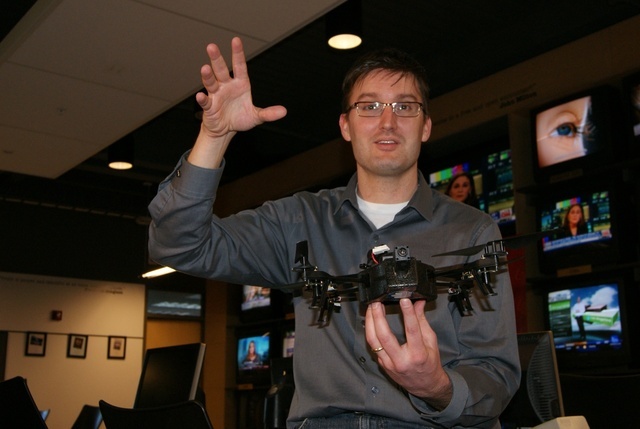 Waite doesn’t teach drone journalism as a class; he teaches it as an extracurricular project. That way he gets students who truly are interested in the work. More and more, it seems that extracurricular projects are good ways to bring contemporary skills to a few students. The problem is that most students have no time for extracurricular work. The only way to reach a large number of students is through curricular changes. The dilemma is that curricular changes are slow and extracurricular projects have few students. Arizona State University’s Walter Cronkite School of Journalism and Mass Communication has created a smart solution to this problem by making an Innovation Lab part of its curriculum. The work the students do in the lab can change every semester, even mid-semester, to answer new problems and ideas. Probably the best way to keep journalism curricula current and meeting the needs of the changing marketplace is to instill a culture of change and risk-taking among faculty. Frankly, that’s a challenge, because universities aren’t designed to take a lot of risks, fail fast if necessary, adapt and move on. But that’s the attitude successful businesses, particularly startups, require. All this makes me wonder: Should we radically change the concept of journalism education? Should we create freestanding journalism institutes to teach the skills journalists need, and staff them with professors of practice on contract, not tenure? These institutes would be designed to offer new skills classes every semester. As demands change, people with those skills are hired. But the hires are temporary. If the skills go out of date, then the teacher either needs to stay current with other skills, or not teach there any longer. At the same time, it makes sense to continue to house the study of journalism’s relationship with and influence on society at universities. Are colleges of journalism and mass communications artificially forced combinations of practice, research and theory that should be pulled apart? Is that why curriculum reform is so difficult? If a journalism education were split between university education and practical skills training, students could do university studies emphasizing critical thinking and research skills, a foreign language and detailed knowledge in topics like health issues or immigration issues. Then they could have a year of communication, digital and data skills training from a media institute staffed with experts who teach there only as long as their skills are the most current the market demands. The university could do what it does best — teach critical thinking, analysis and research while the institute could do what it does best — teach the most current skills today that might not be needed in two years because entirely different ones are demanded. The university could tenure its professors, but the institute shouldn’t. It should grant contracts based on one’s ability to teach the latest technologies and proof that the teaching is effective. A journalism or communications institute is a way to solve some of journalism’s curricular problems. It’s responsive and adaptable because it’s staffed by people current in the latest technologies. It can create partnerships with news organizations to provide community news, as the teaching hospital model does. It can be staffed by people with a variety of skills from any background because academic silos will not be an issue. Its purpose would be to take risks, adapt to change and teach ever-changing technologies. It separates, rather than forces, complicated relationships between the need to respond fast to technological disruptions and the deliberative slower nature of the university. It doesn’t attempt to mix oil and water. Maybe we need a new way to look at the relationship between teaching journalism skills and teaching topical knowledge, research and analysis. Gary Kebbel is a journalism professor at the University of Nebraska-Lincoln. He is working to create a Center for Mobile Media there. Previously he was the journalism program director for the Knight Foundation in Miami. I agree with your assessment of the problems with changing curriculum. But I am not sure that separating culture, critical thinking and research from skills is the answer. The fun part about learning (and teaching) skills at a university is that you learn them in context. I wrote a piece way back in Journalism Educator that talked about teaching students skills in a such a way that they are able to integrate multiple skills, use judgment on how they choose which tools to use and have a perspective on the digital environment. Yes, curriculum change is a problem. So is tenure. And doctoral training. A sideline of all this is that we don’t have any Ph.D. programs training faculty specifically to teach in a hybrid theory/skills environment that is rapidly changing. The people who have come to it are those in Ph.D. programs who brought their own natural inclination to technology to their programs of study. I am interested to see the progress of your Center for Mobile Media. Thanks, Cindy. I think you’re right that there is not a one-size-fits-all answer and that a hybrid model makes sense for a lot of places. What do you think about the fact that Columbia University’s Graduate School of Journalism created the master of arts degree to provide context, while the master of science degree teaches skills? That approach might work for master’s students. They know what they need to round out their careers, either more subject-matter expertise or more skills. But in general, students need both concepts and skills – if we want them to think in innovative and entrepreneurial ways and be able to influence the industry, not just work in it. Last I heard, not very many students are interested in the M.A. in context….. The idea of unbundling the teaching of journalism skills and assigning them to a separate journalism institute is intriguing and certainly would address some of the current barriers to change at universities. I would also advocate for a 5000-foot, rather than 50-foot, view of journalism education. Journalism skills and critical thinking should be taught not just to supply workers to various media entities. They should also be gateway skills that empower all students to be active citizens and use media and media tools as an important forms of civic participation. Jan, I definitely agree that journalism skills of gathering, organizing, synthesizing and presenting information on multiple platforms are life skills that will serve people through their lives. And you’re right, maybe we need to stop thinking about marketing only to students and realize we should be marketing to anyone. I think Jan’s points are on target. Journalism education has a far broader future than most people admit, because of the dramatic need for internet users – and for citizens – to practice the journalism of verification and ethical journalism as they publish on the internet. There are positives and negatives to this slow approach. Should the respected universities follow the cheap (as in quality) degree programs that are set up by for-profit universities to chase the tail on the dog, regardless of whether they can get the faculty or not? I agree change is needed, but I worry about a shiny new toy mentality. Maybe the question should address if ACEJMC can adapt as fast as universities. For these accredited programs, ACEJMC doesn’t care if you have photo/design foundations, but they do care that you have four or so writing classes. So how can programs teach the richness of multimedia if students don’t know how to make engaging images and strong good designs? Timothy, if you are suggesting that we might get significant changes quicker if we focused on the accrediting body’s composition and policies, you’re probably right. Please note that less than 20% of journalism programs in the USA are accredited by ACEJMC. So what ACEJMC is much less relevant to irrelevant to 80+% of J&MC programs. Thank you Jan for the reminder of what a college education is all about! I’ve got to say after spending 20 years in television news, and now 15 years in the academy, I’m really tired of hearing about the “teaching hospital” model and the foundations’ letter. It’s talked about as if it’s some “new” idea, and those of us teaching in journalism schools suddenly became out-of-touch, luddites, the moment we stepped into the classroom. I’m always hearing about innovative ways that my colleagues are engaging students and the community with new technologies and media platforms in projects (in and out of class). I know that doesn’t happen at every journalism school, but it certainly happens a lot more than we get credit for! And why do we require internships if not for students to work in professional environments interacting with professionals?! Just this past spring our college (Ohio University) initiated the Scripps Innovation Challenge in which media from across the region submitted their pressing business, technology and/or audience challenges and students competed to come up with solutions. We had 20 teams with more than 100 students from across campus compete and two teams of prominent professional judges! I’m proud to say that a group of our J-School kids placed first with a very innovative, high tech solution–which BTW was developed as a class project. In this case, it was the students and the academy leading the way, not trying to catch up! Mary, I’d love to learn more about how you set up the Innovation Challenge. It sounds like a great idea. I’m jealous that you were able to get more than 100 students from across campus to compete.